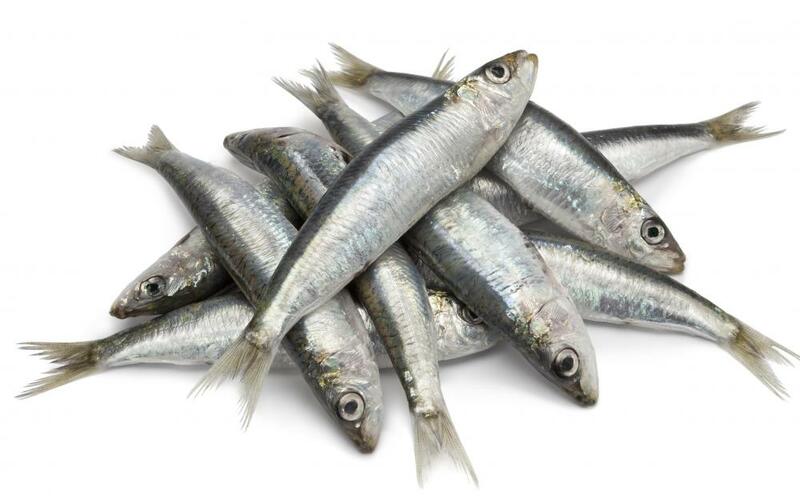 Spanish sardines are a good source of Omega-3 fatty acids. Spanish sardines -- a type of small fish in the herring family -- are rich in calcium and other minerals, vitamin D, and omega-3 fatty acids. Spanish sardines, or Sardinella aurita, are small fish in the herring family that are often used as bait by fishermen. They are eaten by humans as well as many different types of sea creatures. These types of fish live in large schools and are found in subtropical waters of the Atlantic Ocean. Though Spanish sardine populations are not currently threatened with extinction, measures are being taken to prevent over-fishing, which could lead to future endangerment. In general, Spanish sardines have a characteristic appearance. Usually growing to no more than 10 inches (25 cm) long, they have been known to reach 1 foot (30 cm) in length on occasion. They have thin, silvery bodies with blue or green backs and white bellies, and a triangular shaped dorsal fin. Most types of sardines are short-lived and usually do not survive longer than 4 years, due to the fact that they are often eaten by larger fish, including mackerel, grouper, tuna, and all types of snapper. Shallow locations close to shore, such as areas near reefs and piers, are common homes for schools of sardines, which makes them very easy to catch and often over-fished. These groups of fish can be found near the bottom during the daytime and more scattered and closer to the surface during the night. Young sardines quickly reach maturity and spawn several times throughout the year. This helps populations recover quickly in areas that have been heavily fished. Though Spanish sardines are very fatty and have a very strong flavor that some find distasteful, they also include a wide variety of nutrients. They are usually smoked and canned, and can be eaten fried or grilled. Sardines are a very good source of Omega-3 fatty acids, which support the heart and circulatory systems. These types of fish are also high in amino acids, calcium, and vitamin B12. When used as bait, it is important to keep sensitive Spanish sardines in very fresh water that supplies them with plenty of oxygen. They quickly lose their scales and do not usually last very long after being caught. Those that are not used immediately can be frozen and then cut up for future use, but should be kept on ice as long as possible. Once thawed, Spanish sardines become mushy and fall apart easily which makes them difficult to place on a bait hook. What Are the Different Types of Sardine Pasta? What is a Spanish Mackerel? What is a Sardine Fork?